Fuso has made some modifications to its automatic transmissions after reports of lost momentum during gear changes in some conditions. The change affects all rigid models built from November 2013 on, and all prime-movers built since May 2014. Vehicles built before these dates will require a change of the transmission ECU to benefit. 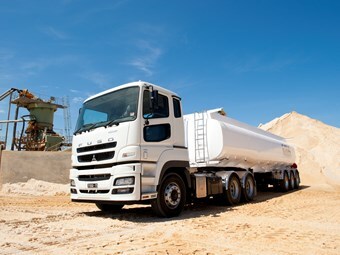 "We recently updated the transmission program in our Motorcade prime mover and one driver reported that it was like he had been given a new truck," Fuso product planning engineer Kevin Johnston says. The two main changes are shortened clutch engagement phase timing and an improved shift map when in 'drive'. The former is to allow for a faster gear-shift, whilst the latter is to allow transmission ‘down’ changes at higher revs whilst the vehicle is decelerating. "We have also changed the steering feedback in our 6x4 models," Johnston says. "Over a period of time, we received feedback from customers saying the steering felt ‘a bit vague’ at highway speeds. "We have responded by designing more pre-load into the system which now gives a more solid steering feel when driving at or near the speed limit," Kevin Johnston said. The steering change applies to all 4x2 and 6x4 trucks built on, or after March 2014 in Japan.